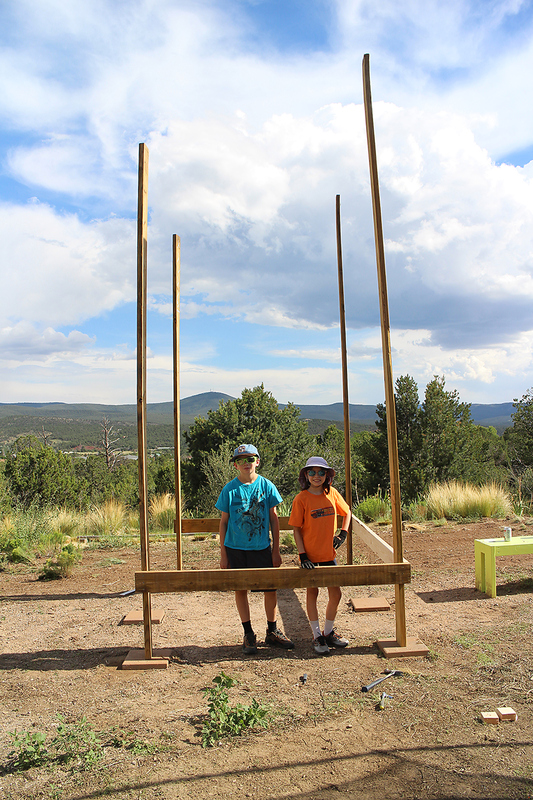 We took down our decade old cedar playset and we're building a new one. It's going to be larger. And it's going to be a lot of work. We are using wood that was from a deck from the kids' grandparents down the street. That has saved us a bunch of money and also contributed to the design. Here's a Sketchup view of what we used to design, plan, and help build the playset. 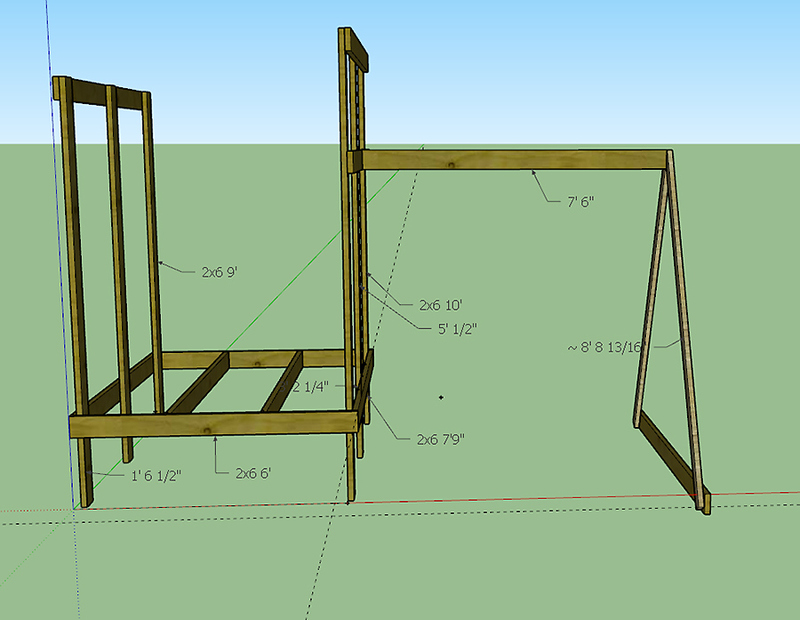 We still have to put on the swingset part and the plan doesn't show some of the structural additions we made. The structure is sitting on our septic field, so we can't dig into the ground and anchor it with concrete. We had 6 concrete pavers, so we leveled the ground and placed those down. Since wood will absorb water from concrete, we placed metal spacers between the wood and concrete. The base consists of 6 vertical 2x6 boards. Those are connected by 2x6 stringers that are 2 feet off the ground. Why off the ground? Snakes. Water. Snakes. We used a level and right-angle square tool to get everything square, straight, and level (even if it doesn't look like it in the photo!). Rather than measure 2 feet up from the ground to place the outside horizontal boards, we used the level. We were given some floor joist holders, so we utilized those to put in two floor joists. We are doing our best to work with bent and warped boards, and so far it's working. We will cut the vertical boards to size later on. The right side will be 10 feet and the left will be 9. 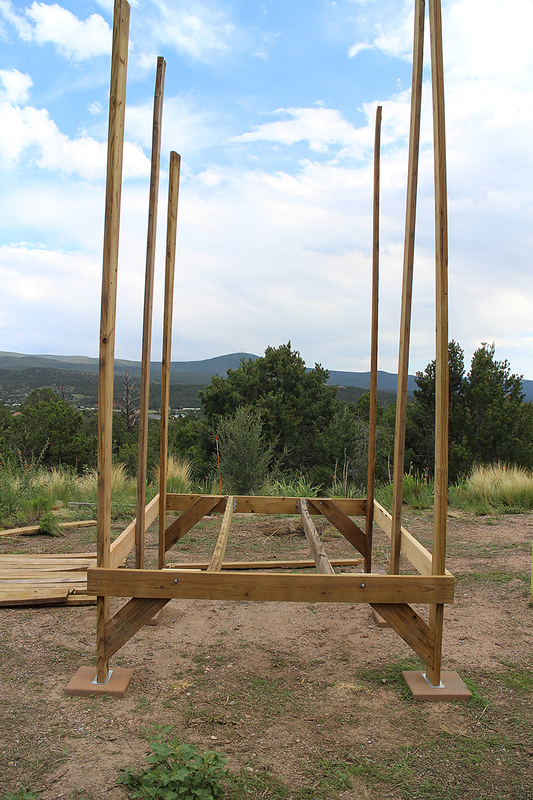 That means the fort will be 8 feet tall and slope down to 7 feet tall. The roof will be angled. 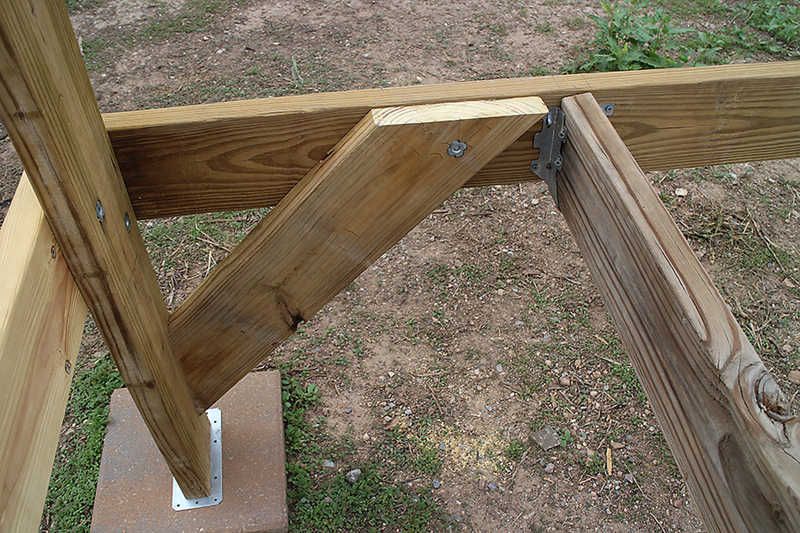 To strengthen the whole playset we installed 4 angle boards cut at 45 degrees. That made the playset sturdy! We will be installing more angles as we go along. Angles are good!